Road test “Lapable” is not a word I would ordinarily use, save for the fact that Apple’s applied it to the new iPad Pro nine-incher. The horrid word is an admission that the smaller iPad Pro is not a strong contender as a laptop replacement, but can do the job when required. And in my experience, a very decent job once you take the leap. I didn’t jump for a while. The iPad Pro is a very, very, refined iPad and I happily wallowed in content consumption and games for my first few days with the device. Batteries lasted all day even when I fought a cold while watching Netflix. The screen is crisp and the whole package is light enough that it can serve as a one-handed World’s Poshest Kindle™ if required. Apple’s attention to hardware detail is amazing: the Pro does a neat trick of ensuring the left audio channel comes from the left speakers even when you rotate the device. Apparently there's even a sensor near the Home Button that can detect the proximity of your finger so that the fingerprint reader isn't always on and sucking battery. In my early days with the Pro I tried Apple's Smart Keyboard, the keyboard-hidden-in-the-cover that distinguishes the Pro from standard iPads. My first efforts produced a shoulder-hunching, downward-looking experience that literally gave me headaches I’d last experienced working on Netbooks. Those aches appeared when using the device for long-ish stints of work on desks. Which isn’t what the iPad Pro is necessarily for: the “lappable” concept means Apple thinks it’s good enough for occasional lap visits, at times when you need to do more than just touch. So when I scored the gig to attend Computex in Taiwan I decided to road test the iPad Pro, deep-ending myself whenever possible by making it my go-to device for surfing, writing and using The Reg’s content management system (CMS) while jumping around between press conferences and exhibition halls. I couldn't quite bring myself to leave my laptop in the hotel, but forced myself to use the iPad whenever possible. The iPad came into its own because WiFi is oddly scarce at Computex. The iPad Pro comes with a slot for your own SIM plus a built-in global SIM that Apple's telecoms partners can access to offer data plans that cover most nations on Earth. I tested the global offering in the cab from Taipei’s Taoyuan airport. About five minutes into the ride I'd signed up for 500MB of local downloads for US$35. That’s not cheap, but certainly is more convenient than hunting for a local SIM. One odd side effect was that GigSky, the carrier offered to me in Taiwan, appeared to offer me a Swedish IP address, if the ads served by publishers was any guide. GigSky integrates well with the iPad Pro: I could see my download balance easily at all times in the Control Panel, so cut out trivial web surfing to make sure my expenses didn’t bloat. The experience of signing up for GigSky is impressively simple, making the iPad Pro a very useful way to get online. For a writer like myself being online is no use until I can get to our CMS and add some stories. The iPad Pro comes with Apple’s Pages word processor, so writing was easy. Pages gets out of the way and lets you write. The Smart Keyboard proved surprisingly easy to wield at speed. It’s a little noisy, but nicely stiff. I felt no more inaccurate than usual and was helped by autocorrect that seldom created comic results. Critically, when the iPad Pro and keyboard are deployed in typing mode, the devices sit flat on your lap. That’s a huge difference compared to the Surface Pros, with their flip-back stand that is quite thin and I find cuts in to one’s legs. I find the Pro is more “lappable” for that reason alone. It’s excellent balance doesn’t hurt either: I could pound the keyboard hard while it was on my lap and never felt like I’d risk a fall. I can’t say that about the Surface Pro 3. 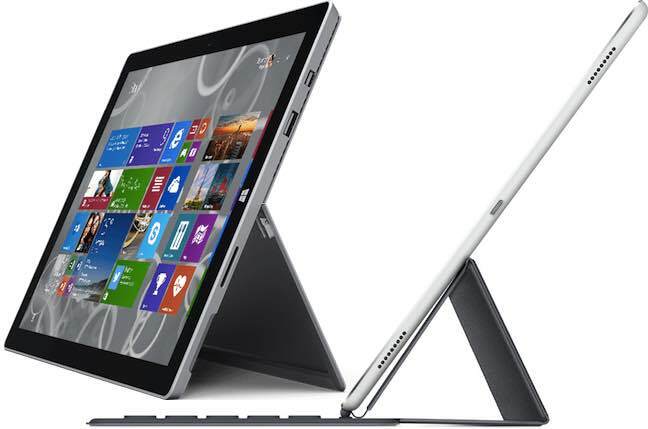 What would you rather have on your lap: The Surface Pro's thin stand or the iPad's Smart Keyboard? Another important feature of Apple’s keyboard is the inclusion of Control, Option and CMD keys, which means text-editing key combinations are available. I use such shortcuts without thinking but am denied them on the iPad’s on-screen keyboard. Adding extra keys to the Pro means I was immediately more productive than on consumer-grade iPads. Yes, I could bring Apple’s svelte Bluetooth keyboard along for the ride with a consumer iPad, but at the expense of a more cluttered bag and battery-related hassle. The Pro and Smart keyboard are a more elegant combination. Using the iPad Pro made for some confused moments when reaching for a mouse that wasn’t there, but I quite quickly became accustomed to mashing the screen instead of rolling a rodent. I found the touch screen is not a precise instrument for selecting an edit point in text and therefore a little frustrating compared to a mouse. Over time I found I can live with it. I don’t like to write directly into The Reg’s CMS, because it is a web app and I worry about losing work with a fat-fingered mistake. So I write in a word processor and then copy and paste into the CMS. That’s a bit tricky in the iPad Pro, and rather slower than using a mouse. On the upside, iOS now has just enough filesystem so it’s easy to save into Dropbox, Google Drive or OneDrive. And also easy to find files and do things like send them as attachments. Writing Reg stories and loading them into our CMS requires simple tools and processes. When Apple familiarised me with the iPad Pro (Cupertino doesn't just shove kit into a courier bag and let you start playing alone) it mentioned that the device really shines when you run apps built for a touch interface. Those apps also make use of the Pencil, which I've tried and found just doesn't fit into my workflows. For now, it's clear that the iPad Pro and Smart Keyboard is a very, very capable mobile device that offers exceptional convenience to travellers and can do a job for simple content creation. But I must confess I couldn't stop myself reaching for the laptop when assembling a photograph-heavy story, and had to force myself to use the iPad for the photographs it contains as my instinct was to use my phone.